Needham, MA (02492) , a premier Boston suburb in Norfolk County, is home to nearly 29,000 New Englanders. The Charles River bounds the town on two sides. It’s that river’s proximity to Boston and the wanton pollution that occurred there that could have endangered Needham’s portion of the river. But the city cleaned up its act in the 90s, and Needham is all the better for it. That’s not to say that many critters and insect pests have also been cleaned up. In fact, you can be sure that there are a few more sinister bugs lurking around the homes of Needham residents than most other Bostonian towns. But with Colonial Pest Control on your side, you won’t have to fight back the hordes alone. We’ve been in this business since 1984, and have since serviced thousands of satisfied customers across the New England region. Our staff entomologists and veteran exterminators are highly adept at providing termination services as well as preventative applications, so call Colonial Pest Control today. Bats – Brown bats come in big and little varieties, though they share mostly similar traits otherwise. You can find bats hanging upside down under the eaves of your home, in your attic or around your property in trees. They are mostly beneficial, especially because of the amount of airborne insects they will consume (a lot), including those, like mosquitoes, that carry viruses. Colonial Pest Control does not kill bats. We will use a failsafe process called exclusion to remove the bats from your home and prevent them from returning. They will naturally move on to more suitable habitats. Termites – There are several types of termites that can exist in one colony, and any sighting of any form of these damaging insects should warrant a call to Colonial Pest Control before they cost you a lot of money. Worker Termites – These tiny, whitish-tan insects do billions of dollars in damage each year to homes and businesses across the country. They don’t just bore into wood—they consume it. A particularly hungry colony can destroy vital weight-bearing beams in your home, or weaken structures like decks and porches that could injure someone with a fall. Winged Adult Termites – You’ll see these termites before the rest of the colony due to their social tendencies and obvious buzzing around your face. They can be differentiated from winged ants by taking note of the body segments: termites only have two while ants have three. This is important to know, since the termination procedures for both will differ. Termites in New England are most commonly subterranean, meaning you’ll find their colony underground. They construct a network of tunnels that lead through your soil and right into your home. Cockroaches – No matter what variety you have in your home, cockroaches can spread disease, eat your food, and create an overall uncomfortable feeling of the heebie-jeebies. American Cockroaches – can reach 2-inches long and prefer damp environments, like your drains or sewer system. (All the more reason to prevent them from entering your home and kitchen.) Where there is one, there are many, so call Colonial Pest Control at first sight. German Cockroaches – are very, very good at leaving pathogens in the home that cause dysentery or food poisoning. They also reproduce at an astonishingly high rate, which means the sooner you call us the better. Oriental Cockroaches – can cause hepatitis, among other illnesses. They can’t climb smooth surfaces, however, so look for them along the floor by drains or other damp places. They only reach an inch or so in length, so they’re often confused with beetles. Spiders – Though most spiders you encounter on a daily basis aren’t overly dangerous, there is one particular variety you may find in the dark recesses of your basement (which makes them even more frightening.) We’re talking, of course, of the Black Widow. One Black Widow bite can send a victim to death, but not before experiencing intense pain, nausea, and fever. The Black Widow secretes a powerful neurotoxin that you’d do best to avoid. Many Black Widows come from the West Coast in produce shipments, though there is evidence of a New England variety. 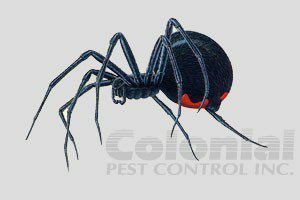 If you suspect any dangerous spider activity around your home, contact the experts at Colonial Pest Control today, or call us at 1-800-525-8084. Great service! Very knowledgeable, we feel like we are in good hands. Thank you.